Meet Erin Castellan, our latest featured LEAP finalist. 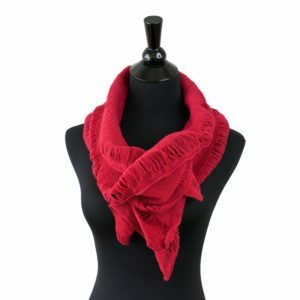 Her fine knit scarfs and accessories add artful comfort and warmth to any outfit. You can find her work in the Store throughout October, November, and December. SCC: Tell us about your work. EC: I create fine knit clothing and accessories. 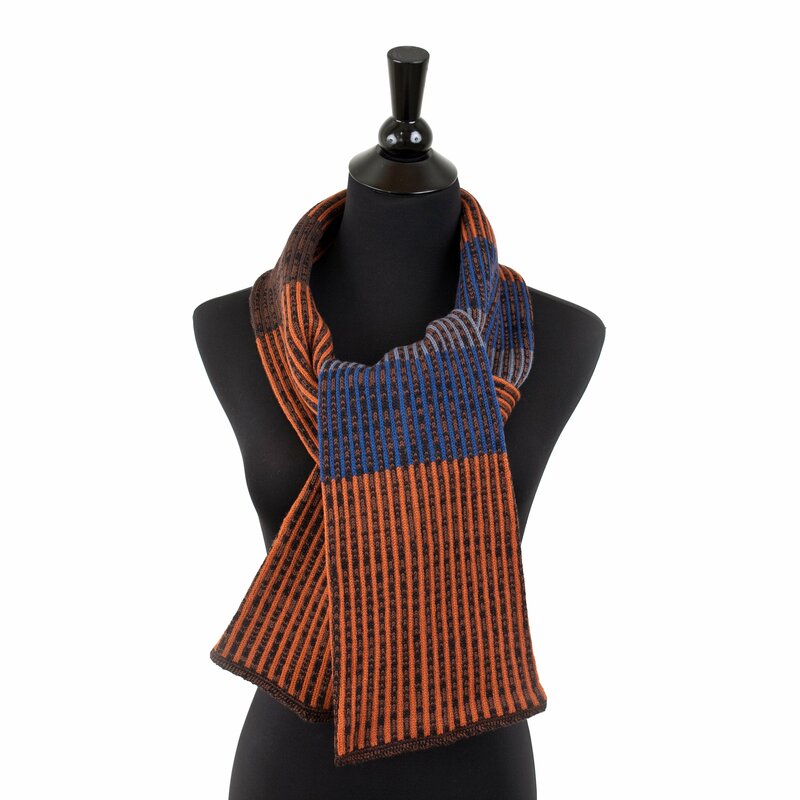 All products are original designs that are hand-loomed on a Brother punch card knitting machine. 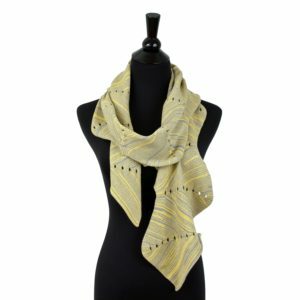 I use high quality merino wool and bamboo yarns to create sweaters, wraps, hats, scarves, and gloves for both special occasions and everyday wear. SCC: Please share with us how your background and education influenced your work. EC: I grew up surrounded by fiber arts. My mother was a spinner, weaver, dyer, and hand-knitter active in the local fiber guild. Some of my earliest memories are of visiting her friend’s sheep farm or falling asleep to the sound of her spinning wheel. Later, I studied Textile Design at the Rhode Island School of Design. I went to RISD with a love of painting and drawing, but chose Textile Design as a major because I felt compelled to study something that could lead to a paying job. Ultimately, I never pursued a career in the textile industry. After graduation I worked a variety of odd jobs and maintained a studio art practice producing embroidered paintings and works on paper. 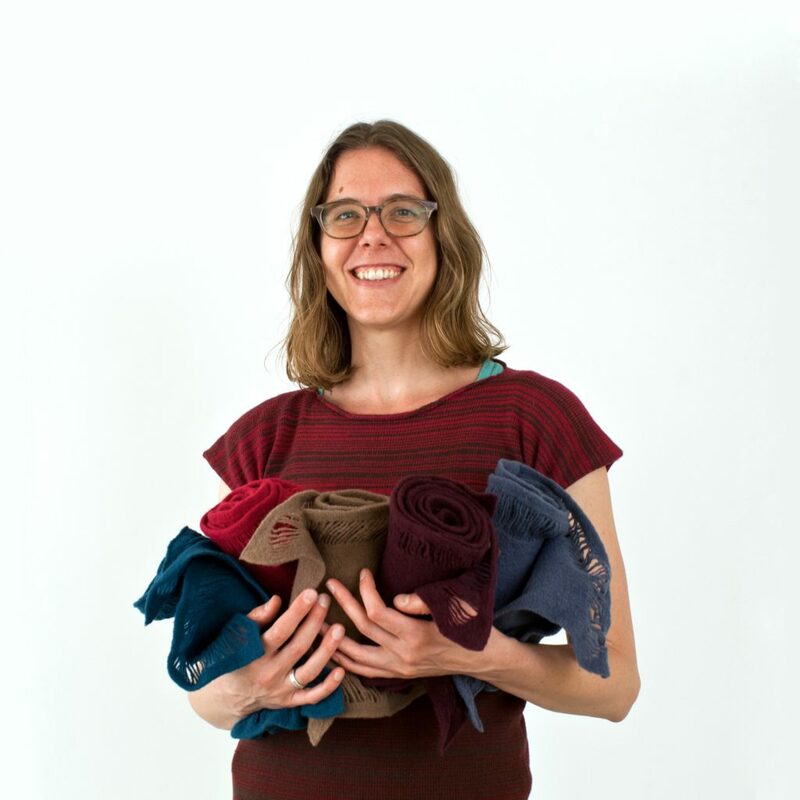 My business, erineleanor knitwear, began as a way to augment my income and support my art habit. To this day, the functional knits allow my artwork to be less driven by commercial pressures and help me lead a more creative life. SCC: Why were you drawn to fiber? EC: As I mentioned above, I grew up around fiber materials and processes. Fiber materials often have many familiar, tender, and comforting associations. I am also drawn to accumulative processes such as embroidery and knitting because they provide slowness and steadiness in a constantly changing world. There is something marvelous about watching a form develop slowly over time. Each stitch visibly records time passing and is a tangible record of life having been lived. EC: For the past 10-12 years I have divided my studio practice between making functional knits and embroidered paintings. Recently the two practices have begun to influence each other. Knitting has been popping up in my paintings and I have begun taking a more painterly approach to my knitwear. I enjoy the technical challenge of designing sculptural knits, but I also spend a lot of time thinking about how we interact with and perceive the surrounding world. I love visual perception, color relativity, and being surprised by unusual colors or textures in nature. SCC: What is the best piece of advice you’ve received as an artist? EC: Wake up each morning and ask yourself what you feel like doing. Then do it. This is hard advice to follow when juggling many tasks, full-time employment, social obligations and looming deadlines, but it is something I try to keep in mind when approaching my creative work. It has been quite helpful for me to follow my energy, creativity, and interests on any given day. Sometimes I wake up with the drive to build inventory and do production knitting. Other days I feel like tackling administrative tasks at the computer or solving the technical problems involved with designing a new sweater. I’ve found that listening to my heart and following my energy levels makes each day and each task more productive and enjoyable. SCC: What advice do you have for others considering a career in the arts? EC: Make efforts to maintain a healthy, balanced life full of hobbies and interests beyond the arts. Don’t let your creative business consume you. Don’t forget what first sparked your interest in a creative life. I think it’s easy to get swept up in the day-to-day routine of making. It’s easy to wake up and realize you’re following someone else’s dream. There are a million paths to take in life and many definitions of success. Try to stay true to one that brings you the most joy and satisfaction.